America got a little bit smaller on the night of February 8, 1924. Or at least it felt that way. From a banquet hall at the Congress Hotel in Chicago one man could be heard simultaneously in New York, Jacksonville, Denver, San Francisco, and even Havana, Cuba (which was no longer technically controlled by the U.S. but was certainly a playground for American corporations at the time). This was the first coast-to-coast radio broadcast and it was accomplished less than a decade after the first coast-to-coast telephone call was placed in 1915. The future of broadcasting had arrived. General John J. Carty, a vice president at Bell Telephone Company, spoke from Chicago, addressing by name the various telephone managers in each city where he was being heard. Only about 10% of Americans had a radio set in 1924, but "millions" of others also heard the broadcast, all tuning in with the new radio sets which were quickly becoming quite a coveted new piece of tech for American homes. The April 1924 issue of Science and Invention magazine included this map of the momentous occasion, showing the various wired connections between cities that were necessary to broadcast the message across great distances. The magazine gave readers an idea of the scope of the project, telling of hardships and explaining that the cables were reaching a mile below sea level in the southeast, and a mile above sea level in the Rocky Mountains. At a point near Winnemucca, Nevada, a severe blizzard was raging. Scores of men were at work keeping the lines in repair so that communication could be carried on without interruption. At one point of the line near Key West, the submarine cable was one mile below sea level, while near Denver it was a mile above sea level. The illustrations of people saying "Hello! Frisco!" is in reference to the first coast-to-coast telephone call made between an aging Alexander Graham Bell and his former assistant Thomas Watson on January 15, 1915 during the Panama-Pacific International Exposition. 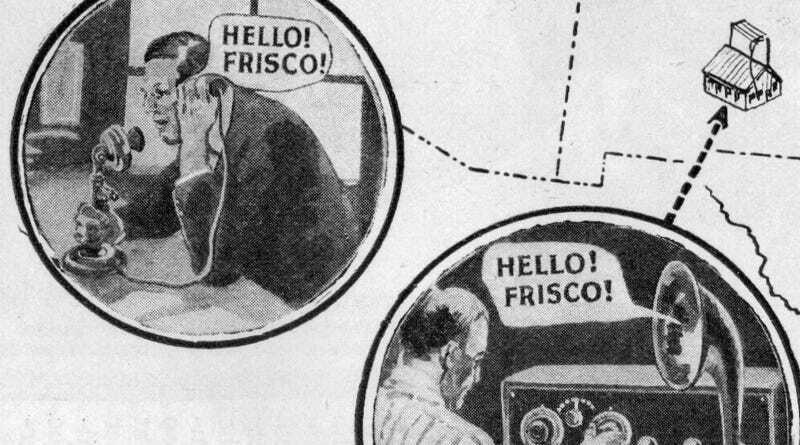 Their call, from Bell in New York to Watson in San Francisco, would inspire the title of the 1943 film Hello, Frisco, Hello which is set at the 1915 Exposition. Somewhat strangely, in all the accounts I've read of that 1915 phone call, Bell never actually said "hello Frisco." But given the tremendous distaste so many people from San Francisco have for the term Frisco, I suppose it's for the best. At least they didn't say "hello San Fran."